Rep. Ilhan Omar refused to comment on Monday after several media outlets are reporting the beleaguered Minnesota Congresswoman is under investigation for “illegal dealings” and may see prison time. Omar is running scared as her alleged dirty deals catch up with her. You don’t want to miss this. Rep. Ilhan Omar has been nothing but trouble after she appeared on Capitol Hill last January, elected as the Representative for Minnesota’s 6th District. The 37-year-old was at the center of making shocking anti-Semitic comments which sparked a national debate and a weak resolution by the Democrats. Now, she is in hot water following two separate complaints filed against the Muslim Congresswoman. “Sinclair reporter James Rosen confirmed Monday morning that authorities recently completed investigations into two complaints concerning campaign finance violations against Democrat Rep. Ilhan Omar,” the Daily Wire reports. And wait until you find out what she was doing with her campaign funds. 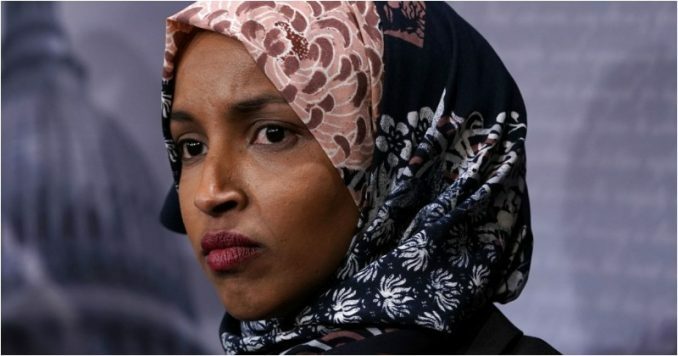 The Minnesota Campaign Finance Board is investigating Omar after Minnesota GOP State Rep. Steve Drazkowski filed two complaints alleging she spent nearly $6,000 in campaign funds for personal use while she served in the Minnesota legislature, reported WJLA. “In referring Omar to the Minnesota Campaign Finance Board, Drazkowski alleged that Omar improperly spent close to $6,000 in campaign funds for personal use, including payments to her divorce attorney and for travel to Boston and Estonia,” says the report via the Daily Wire. The campaign finance allegations come on the heels of a separate incident where the freshman congresswoman had to return $2,500 in speaking fees, according to The Pioneer Press. Omar accepted payment from Normandale Community College and Inver Hills Community College in 2017, despite Minnesota House rules barring lawmakers from accepting speaking fees from entities with business at the Legislature. But that’s not all. The divorce is especially troubling for the freshman lawmaker with many unconfirmed reports alleging she was married to her brother for “green card” purposes. “There’s a political fear that people have of being called a name, being called a bigot, being called racist, being called Islamophobic,” said Rep. Steve Drazkowski, a Republican. When Omar was questioned about the probe into the alleged finance violations on Monday, she refused to respond. Earlier this year, the Democrat denied the alleged indiscretions, though the complaints were still unconfirmed to the public at the time. And due to the intent, Omar could see prison time if found guilty. “The difference between a campaign finance violation that is a crime and a campaign finance violation is a civil matter is whether the action was taking knowingly and willfully,” explained Paul S. Ryan, the Vice President of Policy & Litigation at Common Cause. There is no doubt Omar knew using campaign funds to pay for her divorce was not legal. So, these alleged complaints could rise to the level of criminal prosecution. The Democrat has found herself under fire on more than one occasion for past and present comments she’s made about Jews and Israel. In March, for example, Omar suggested Jewish Americans have “dual loyalty” after she was criticized for past comments perceived as anti-Semitic. “Lawmakers must be able to debate w/o prejudice or bigotry. I am saddened that Rep. Omar continues to mischaracterize support for Israel. I urge her to retract this statement and engage in further dialogue with the Jewish community on why these comments are so hurtful,” said Rep. Nita Lowey (D-NY), who is Jewish. Many truly thought it was only a matter of time before something like this came up with regards to Rep. Omar. So, it’s not shocking that she may have committed fraud on her own campaign. This woman has been cited by the Jewish community for years as a truly disgusting anti-Semite who refused their help and maintained all her anti-Semitic remarks. Now, it looks like she is really in hot water this time. This isn’t just about her statements. These are potential crimes that can rise to the level of criminal prosecution and potential prison time. We can’t think of a better way for the controversial Minnesota Congresswoman to end her short career in Washington DC.